Editor: We are pleased to have authors Dr. Michelle Joy and Dr. Jody Foster share their insights into one aspect of creating a comfortable work environment by learning to understand your boss. A boss can make the workplace miserable. Given how much time people spend in the office, life itself can become wretched. You start to feel angry, humiliated, anxious, and depressed. You tell your coworkers just how bad this supervisor is, how they treat you, how they make you feel. Your boss really is a “jerk,” you claim, “a schmuck” you all agree. You consider doing something about it but take no steps. You hope that they stop acting this way and that everything can just get better on its own. 1. Acknowledge what you might be bringing to the table and why your boss’ behavior bothers you so much. Because even if you have found solace in group gossip about your manager, chances are there are some reasons why you are so personally frustrated by this person. Do they remind you of someone else in life? Can you absolutely not tolerate criticism? What is it about you that makes your boss seem so bad? As intolerable as they seem, and as little as you want to do this, you may be surprised at what answers arise. 2. The complementary approach – one that can be incredibly hard to come to terms with – is to empathize with your boss. Why on earth would we suggest finding an empathic spot for this person when it’s quite literally the last thing you want to do? Because if you must find a way to get along, you’ll need to take the long view and try to understand why they act in this particular way. In allowing yourself to empathize with your boss, you also give space for some of the negativity to fade away. In understanding her and yourself, a desire to learn and to grow can start to replace the bottled up disdain spilling into every part of your day. We’ve consulted with a number of employees over the years who have had significant problems with their bosses. In all situations, we’ve asked the workers to ask why they seemed to be so rattled by these superiors. Why do they feel so minimized and humiliated when, for example, they were scolded or criticized? These are all issues that an employee brings to the table and must evaluate. Perhaps the same boss wouldn’t bother another colleague quite as much. We try to help people understand that it’s their responsibilities to look inward for answers to some of these questions. At the same time, consulting employees often find themselves wondering whether people who ascend to management positions possess some particular characteristics. So we ask them to empathize and think about what be driving someone’s boss to be so dismissive of their feelings. What does my client know about this person? What is the office like for the boss? What was their path to promotion? What in this story might have caused her to behave so distastefully? Most importantly, we try to frame what internal struggles the boss might be dealing with that cause distasteful behavior. Perhaps a micromanaging boss is so incredibly afraid of losing control that they need to discipline everyone in the office to feel more secure. Maybe their whole life has spent trying to be “perfect” in order to please others, they take these insecurities out on those their direct reports. Perhaps a seemingly arrogant boss only flies off the handle when they feel exposed or humiliated. They are afraid everyone might discover that the big job is just a mask covering cripplingly low self-esteem, and they constantly fears discovery of this fraudulent, inadequate self. In trying to understand the boss’s underlying anxiety, an employee can interact in ways that help keep the supervisor’s fear at bay. Find little ways to show the boss they are in control if necessary. If the boss has fragile self-esteem, acknowledge their positives when opportunities arise. If a disorganized boss can’t finish anything and slows everyone else down, learn to interact with them in bite-sized tasks and complete them one at a time. 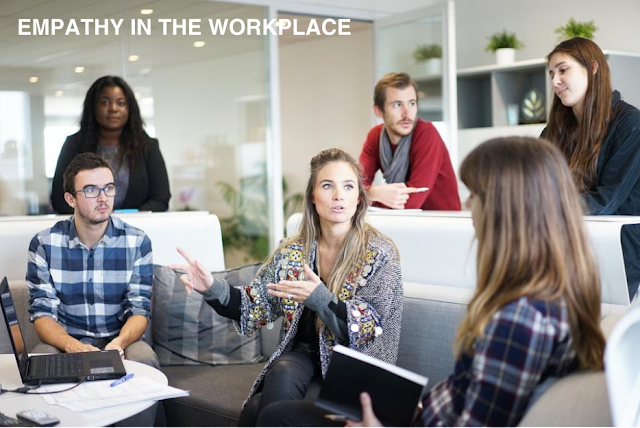 The hardest part is acknowledging our own roles – and capabilities – in making the workplace more comfortable. In accepting the task of learning about ourselves and our bosses, we can do just that. People want to tell you about themselves and will do so all the time; they want to be heard. Just look and listen with the intent to understand. It works every time. Dr. Michelle Joy and Dr. Jody Foster are the authors of The Schmuck in My Office: How to Deal Effectively with Difficult People at Work. For more information, pelase visit, www.schmuckinmyoffice.com.